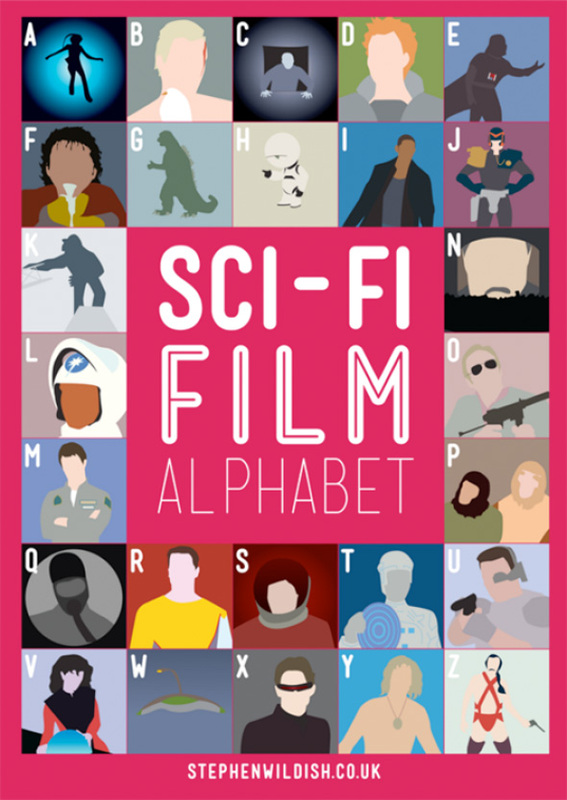 Check This Out: Can You Figure Out the Entire Sci-Fi Film Alphabet? Just recently, all the horror fans out there had their knowledge of the genre tested in the form of The Horror Film Alphabet, highlighting some of the most iconic horror films with minimalist illustrations for each of the 26 letters of the alphabet. This followed a look at film alphabets through the decades all the way back to the 60's and now artist Stephen Wildish has delivered another round of fun for genre lovers in the form of The Sci-Fi Film Alphabet. Once again, there's some pretty obvious ones here, but the rest of the internet will have to help you finish the entire alphabet of science fiction cinema from decades past. See it below! I think it's "I robot". The Birds is not sci-fi. "B" is Blade Runner. How the eff did these hard-on's beat me!? I was first!! Yeah, I think its Solaris. Good guess! I think S is last Starfighter. What the heck is Z and Y? Probably ZARDOZ and YOR, THE HUNTER FROM THE FUTURE. And I'd also agree about S being THE LAST STARFIGHTER. Nope... "L" is the Last Starfighter. It's the helmet and logo from the movie. SH*T!! Damn, that's what I was GOING to say, but didn't. Methinks I need new glasses; thanks for pointing out the error. Y - Yor, the Hunter from the Future. And N could be Big Brother from "Nineteen Eighty-Four"
Abyss, Blade Runner, Cube, Dune, Empire Syrikes Back, [[F? ]], Godzilla, Hitchhiker’s guide, I robot, Judge Dredd, King Kong, [[L? ]], Moon, Nineteen Eighty-Four, Omega Man, Planet of the apes, Running Man, SOLARIS (come on people! ), Tron, Universal Soldier, V, War of the worlds, X Men, [[Y? ]], Zardoz. "F" is The Fly. The scene is him vomiting his digestive juices on his hands wearing work gloves. Does anyone know what Y is. O say Year one but peoplenare saying YorX honestly I think it's a bit easier to figure out than . What does everyone else rhino? N= Nineteen eighty four or 1984. Hated that book. why is king kong listed? Anyone know what V or Y are? Y is definitely Yor and not Year One. He is a prehistoric blonde hunter with a mysterious medallion around his neck. A:Abyss,B:?, C:?, D:Dune,E:Empire Strikes Back, F:The Fly, G:Godzilla, H:Hitch Hikers Guide to the Galaxy,I:I-Robt, J:Judge Dredd, K:King Kong, L:Last Starfighter, M:Moon, N: Nineteen Eighty-Four, O:?, P:Planet of the Apes, Q:?, R:Running Man, S:?, T:Tron, U:Universal Soldier, V: V, W:?, X:X-Men, Y:?, Z:?